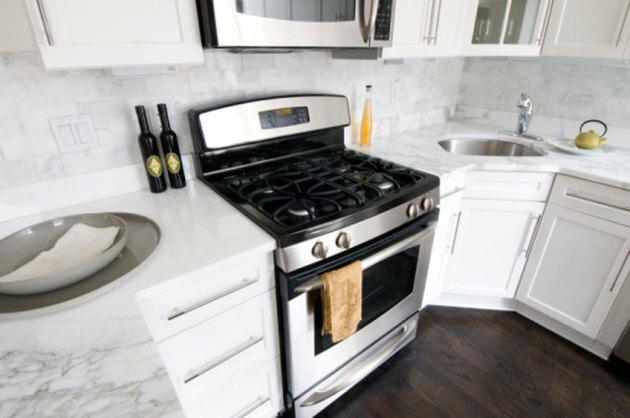 General Electric (GE) made a series of XL44 stoves for residential use in both gas and electric models with oven windows, a self-cleaning feature and porcelain enamel coating. Despite the fact that this series is no longer manufactured, there are ways you can troubleshoot problems with your GE XL44 stove oven yourself without wasting time and money with calls to arrange for service support. The most common issues can usually be resolved yourself anyway. Tighten the lightbulb inside the XL44 oven if the light is not working. Replace the bulb if it still does not light. Confirm the pilot light(s) are lit for gas models. The oven does not heat up or operate without the pilot light(s) being lit. Ensure the XL44 oven power cord is plugged into a working electrical outlet. Reset the circuit breaker and replace blown fuses as necessary. Adjust the oven temperature knob if food is coming out too cold or hot. Loosen the screws slightly on the back of the oven temperature knob. Turn the top screw clockwise to raise the temperature and counterclockwise to lower the temperature -- each click designating a 10-degree Fahrenheit adjustment. GE recommends to adjust only 10 degrees at a time, using the oven afterward to confirm accuracy before adjusting again, if necessary. Confirm the GE XL44 oven bottom is secure and in the proper position. Improper positioning of the oven bottom prevents adequate broiling. Verify you are using the appropriate cookware for the food and cooking method.